Um..ok. I need some opinions. 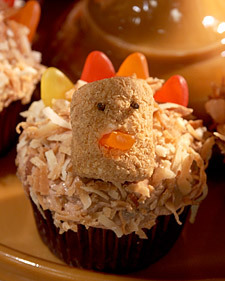 Now don't get me wrong, I think the idea of the cupcake is great, yet I am not seeing how it looks like a turkey.....? Moving on to the positive...this is quite the festive little treat for Turkey Day...ENJOY!!!! Ice cupcakes with chocolate buttercream. Dip top of each cupcake in coconut to cover; set aside. To make the turkey heads: stick the point of a wet toothpick into the side of a marshmallow in two spots, about 1/2-inch apart. Fill the holes with chocolate sprinkles to resemble eyes. Cut a small triangular piece of gummy fish from the head of a fish, to resemble a beak. Cut a small slit in the marshmallow below the eyes, and insert the beak. Place marshmallow head on cupcake. Repeat with remaining marshmallows. To make the tail feathers: Insert 4 gummy fish, tails first, into each cupcake across from the heads.